Dine in the desert with Ayers Rock Resort. The hotel consists of 5 hotels who are celebrating bush tucker and hero-ing the mystical Field of Light. Australia’s beauty is vast and its landmarks are many, but standing among it all is one infamous monolith that captures the very essence of this great southern land. Uluru, a true icon that captures both the culture and spirit of the land, stands proud in the country’s red centre, demanding respect while providing the meaningful experience travellers crave. At 300 million years old, the UNESCO World Heritage-listed site has always been a force, but it has evolved to become a sophisticated travel destination too, where visitors can enjoy the awe-inspiring landscape alongside world-class cultural interaction and distinctive dining. Since launching in 2016, internationally acclaimed artist Bruce Munro’s Field of Light has managed the unthinkable: it has managed to compete successfully with Uluru for attention. Thankfully though, it’s not so much a competition as it is a beautiful friendship. The breathtaking installation, a dazzling fantasy garden of 50,000 ‘seeds’ of light, adds a sea of undulating, luminous colour to the rich red earth its towering neighbour is famous for. The award-winning exhibition, located at Voyages Ayers Rock Resort, is aptly named Tili Wiru Tjuta Nyakutjaku in local Pitjantjatjara language, which translates to ‘looking at lots of beautiful lights’. As darkness falls, the radiant frosted-glass spheres bloom atop slender stems, which are connected via illuminated optical fibre. The show, an experience Munro himself says changed his life, has made an incredible impact on tourism in this country, and an even bigger impact on tourists – some 200,000 of them since its beginnings in 2016. That figure continues to climb following the announcement Munro’s feat will remain delicately, dramatically outstretched across the space of nine football fields until 2020. The Sounds of Silence, Australia’s first under-the-stars dining experience, Uluru. As well as mind-blowing art, Uluru goes beautifully with a side of fine dining. The Sounds of Silence, Australia’s first under-the-stars dining experience, celebrates its 25th anniversary this year, and it is still delivering one of the most unforgettable dining experiences in the country. A celebration of the Australian outback, crisp white tablecloths juxtapose against the red dunes and, as the sun dips behind the majestic backdrop, the night sky performs a show of its own with its blanket of glittering stars, many of which cannot be seen anywhere else in the world. Then there’s the food. Native Australian ingredients are at the forefront of the menu. Think kangaroo, native pepperberry, finger lime, lemon myrtle and crocodile. The equally delightful Tali Wiru is an intimate dining experience overlooking the celebrity monolith and the domes of Kata Tjuta, the group of spectacular bornhardts also known as the Olgas. The open-air experience is in its fifth season and indigenous flavours return as the star. Take the pressed wallaby with fermented quandong, hung yoghurt, pomegranate and puffed ancient grains, for example – or, for the sweet-toothed among us, textures of chocolate with Davidson plum, lemon myrtle, quandong and hot chocolate sauce. These are the kinds of bush tucker delicacies that will leave a lasting impression. Tali Wiru means ‘beautiful dune’ in Pitjantjatjara, and the beautiful dune and its captivating, hulking neighbour is the bucket-list item travel dreams are made of. 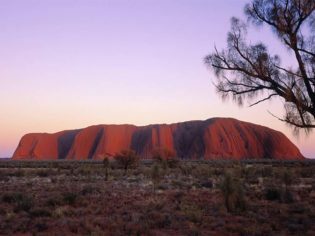 Uluru is beautiful year round, but most people choose to travel between April and October, when the days are vibrant and warm and the nights are crisp. Travel between September and November to experience the abundance of outback flora and wildflowers, or between December and March for beautiful balmy nights and sun-laden days. It pays to book your accommodation as well as your tours well in advance, particularly if you’re planning to travel between the peak months in April to October, or during any of the school holidays. Ayers Rock Resort has many different accommodation styles at all different levels and budgets. If you want to access the best offers and choice of accommodation, it is recommended you book at least four to five months in advance. Virgin Australia and Jetstar operate daily direct flights to Ayers Rock Airport from Sydney; Jetstar also operates regular direct flights from Brisbane and Melbourne; Qantas offer a connecting service via Alice Springs from most capital cities. Ayers Rock Resort is comprised of five hotels including the five-star Sails in the Desert, Desert Gardens Hotel, Emu Walk Apartments, The Lost Camel, the authentic Outback Pioneer Hotel and Lodge, and a campground featuring powered and non-powered sites.